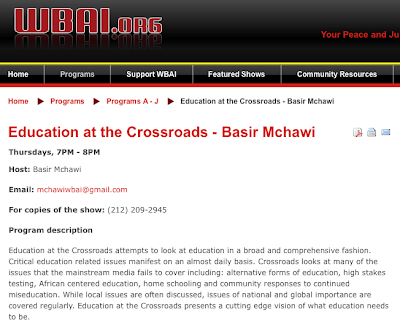 Call in to WBAI tonight, 7 – 8 p.m. The host of the program, Basir Mchawi was at the Tweed demonstration last Monday and invited people to call if they had something to say. We think he was really trying to say that people have to start speaking up if anything is going to change the destructive course of BloomKlein in NYC education. AND SEE THE POST RIGHT BELOW THIS FOR ALL THE OTHER ACTIONS THIS MONTH.